There is no doubt in the fact that PUBG has dethroned many games to become the top mobile game. 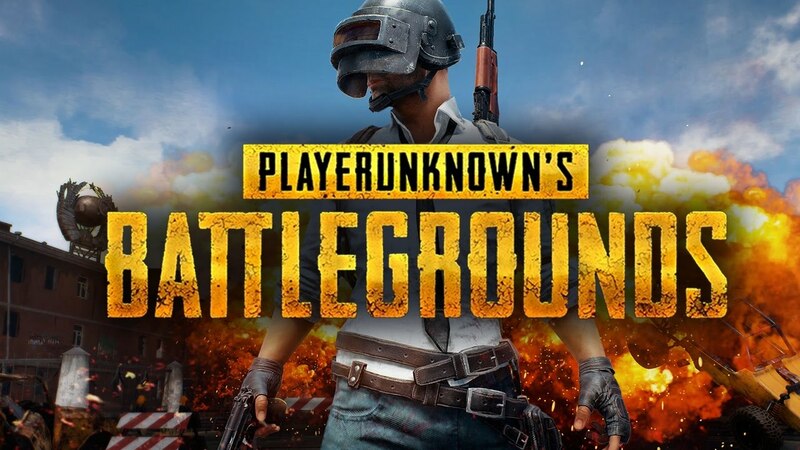 Games like Clash Of Clans and Mini Militia have started going down the ladder, and all is because of only one game, and one name – PUBG. Well, we know the game needs a lot of strategies; you make correct plans and strategies, and you win the game, or rather you win Chicken Dinner! You must have seen many players and YouTube streamers doing several challenges in PUBG to make the game interesting. Many uses only melee weapons like Pan, Crowbar etc. and others use only shotguns or pistols. Everything depends upon your strategy. If you make good plans and implement them, you can win a game without any weapons even. But winning a game without weapons and without guns blazing would be somewhat boring. So in the world where we are comparing and ranking everything (or almost everything! ), let us take a look at the Top 10 guns which can prove handy for you if you want a Chicken Dinner in PUBG. And yeah, don’t forget to have all the suggested attachments for sure! Don’t be surprised to see a pistol on the list at number 10. Just imagine a case where you shoot at an enemy with a gun which has a high reloading time, and you are reloading your gun when your enemy shoots you down. How would it feel? Very bad. In such cases, a pistol can prove handy as a sidearm. And out of all pistols, the P18C is the best, with its attachments. The P18C is the only sidearm that is capable of fully-automatic fire. With a 17 round magazine which is expandable to 25 with an attachment, this one will be a blessing in the SMG slot. A red dot will help you set a perfect target on your enemy, and a sordid suppressor will help you take them down silently. Yes, there is a shotgun on the list too. But, this one is not like other typical shotguns. It is something different. It is a go gun if you want to just close your eyes and tap the fire button. And believe me, the damage it causes is unbelievable, but only at close range. 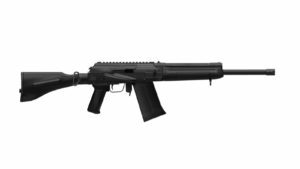 The S12K aka The Saiga is almost unmatched when you are lying down and want raw but fast firepower at a short range. And, you would not want to be caught shooting with this at anything other than close range. Surprisingly, this gun uses the AR attachments and not the typical shotgun ones, though you can’t attach a choke, but a compensator will do good with the recoil. And with the extended mag, you can increase the pain from five shells to eight. And yeah, the red dot is just for style! You must be laughing seeing this one on the list. Right? If you are, then you are unaware of the use of the gun and damage it causes. 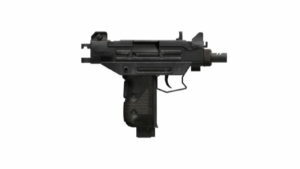 The Micro UZI typically spawns with a little attachment lying here and there. But of all these, the luckiest will be the stock. It will make the gun a little more controllable. It doesn’t matter whatever you add for improving the range, it is useless. But at closer range, and along with perfect attachments, you will become the hell of a bullet sprayer with the UZI. For added fun, you can attach the extended mag to increase the capacity from 25 to 35. Is some kind of joke going on here? – I know this is what you are thinking. The Vector may seem a lol at first sight with its 13-round magazine, but believe me it is one hell of a destroyer if handled correctly. The Vector has a unique design that mitigates recoil and allows it to overcome the major control issues that sub-machine guns face. You just need some luck and footwork to make it prove useful. It may be an okay-type gun at first, but it raises temps with it’s extended magazine. 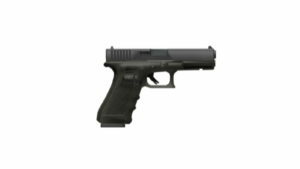 Once that’s attached, you have an increased capacity from 13 to 25, and this may perhaps be one of the best close range gun. Further, attach a vertical fore grip, red dot sight, and tactical stock, and then surprise your enemy with its accuracy. It may not be a right choice for long or medium range fights, but in the final moments of the game, you need nothing more than a fully loaded Vector. The Mini 14 is a fun toy want to be with you when you are looking for a mid-to-long-range weapon. 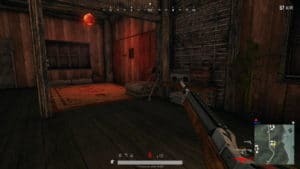 No, it is not as cool as Kar98K or SLR, but it has one thing unique and rare – it is common! 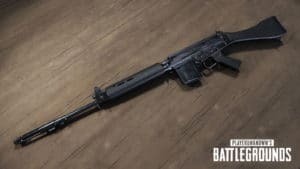 The powerhouse gun in PUBG, with the highest damage rate per second than any other DMR available in the gun. It has four attachment slots, but it may cause a little mayhem to the users because of its high recoil. Don’t worry. The cheek pad is available and it will help to somewhat dampen the sway. If you have already used MK14, you will find plenty of similarities with this one. But, of you don’t find the cheek pad, you are surely going to have trouble with the recoil, thus making it a difficult choice for newbies. 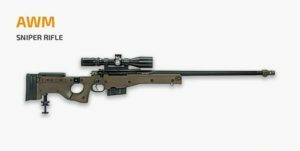 But, it is really a formidable mid range or long range weapon and can be handy for snipers. 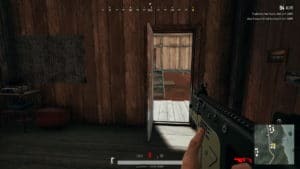 The M16A4 lacks the full automatic firing option, but can cause some real pain to the opponents when placed in the hands of professional PUBG players. Well, it is not a good choice for the ones who rely on Spray and Pray tactics. But the attachments like Extended Mag and suppressor can help in get things rolling with the burst fire mode coming to play. With high muzzle velocity and low recoil, nothing much is needed to make this versatile gun a viable option. But adding the half grip and a 4x scope could prove helpful in increasing range. Keeping all these in mind, it can be said that it is not a great choice for mid-range fights but can be useful in close or long range attacks. If you are in the battlefield, but are empty-handed looking for a gun and see this Scar-L in front of you, don’t hesitate to hold it up, either if you are planning for a fight or have a plan of defense. It features four attachment slots, which is all you really need to conquer the battlefield, given its versatile nature. The red dot sight is helpful for close range combats, but you can use a 4x scope if you want to engage in some serious mid range fights. 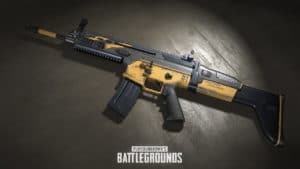 If you’re the type of player who believes in spray and pray tactics, the SCAR-L can be a handy weapon as well, though the fore grip and a suppressor is recommended if you’re going to spray up the battlefield with bullets without giving your position away immediately. And the extended magazine comes in there too. 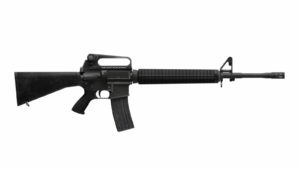 Somewhat same functions are of the M416 rifle. So you can choose that too! 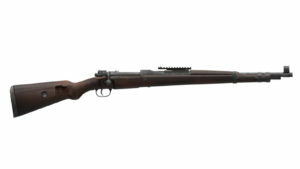 The Karabiner 98 Kurz, or the Kar98k, is a vicious sniper rifle that’s an excellent choice in terms of stopping power and long-range ability. It may not be so good in its firing rate, but you can’t complain about the damage it causes – the bullet pierces through the armor like nobody’s business – and its accuracy. And it can make a sniper’s dream come true as it is common to find at various places on the map. The Kar98k can take any type of scope, muzzle attachment, and the useful cheek pad, which dampens your recoil and gives you a great kill. It may not be the greatest of snipers, but isn’t the most complicated one either, and sometimes simplicity is the best! Well, you can call this the greatest or the king of all snipers. But, you need to be very nice in targeting, and if you are, then one shot is enough for a kill. You will face some problem regarding its availability. You will get this only through air drops, and even if you reach one drop, there is no guarantee that other players will let you go to the drop and pick it up. But for snipers, this gun is like a blessing. Hold this in your hand, set your target and click the trigger once. You will soon find your kill section one up!